White (porcelain) and other types of cosmetic crowns provided at our dental practice in Worthing. Treatment cost estimate given. Latest aesthetic technics. Crowns can be fitted at front or back teeth or dental implants. Some crowns can be repaired or recemented (refixed) in our clinic. We provide all types of cosmetic, porcelain, composite or metal coloured crowns at our surgery. A dental crown is a tooth-shaped "cap" that is placed over a tooth to cover the tooth and to restore its shape and size, strength and improve its appearance. When cemented into place, fully encase the entire visible portion of a tooth that lies at and above the gum line. Why would I need one? They are an ideal way to restore teeth that have been broken, or have been weakened by decay or a very large filling. Porcelain bonded to precious or non-precious metal: this is what the most are made from. A precious or non-precious metal base is made and then porcelain is applied in layers over it. Porcelain crowns: are made entirely out of porcelain and are not as strong as bonded crowns, but they can look very natural and are most often used for front teeth. 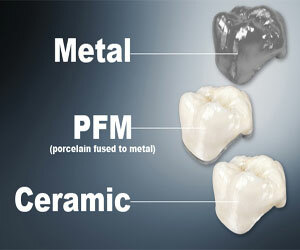 Zirconium crowns: this modern material is metal free. It can give the strength of a bonded crown and the appearance of a porcelain crown. This makes it suitable for use in all areas of the mouth. Gold alloy crowns: gold is one of the oldest filling materials. Today it is used with other metals to increase its strength, which makes it a very hard-wearing restoration. These crowns are silver or gold in colour. How is a tooth prepared for crown? The dentist will prepare the tooth so it is the ideal shape for the crown. This will involve removing most of the outer surface, and leaving a strong inner core. The amount of the tooth removed will be the same as the thickness of the crown. Once the tooth is shaped, the dentist will take an impression (mould) of the prepared tooth, one of the other jaw, and possibly another to mark the way you bite together. The impressions will then be given to the dental technician, along with details of the shade to use and other information needed for the crown to be made. What is a post crown? If a tooth is root filled the dentist may have to insert a post before placing a crown. A post provides support and helps the crown stay in place. The weakened crown part of the tooth may be shortened to gum level. How is the crown fitted? It will be fixed in place with special dental cement or adhesive. The cement forms a seal to hold it in place. Some dentists and practices use screw to fix a crown to a dental implant. You will need to have at least two visits. The first is to have the tooth prepared, the impressions taken, the shade matched and the temporary crown fitted. The second is to fit the permanent crown. There will usually be about 2 weeks in between appointments. Some other dentists (very few) have a crown making machine in their practices. These dentists do not need to send the impressions to the dental laboratory. In later case all the work is done and cemented in one visit. How do I care for my crown? How long your crown lasts depends on how well you look after it. The crown itself cannot decay, but decay can start where the edge of the crown joins the tooth. Therefore, to prevent decay affecting the crown, it is important to keep this area just as clean as you would your natural teeth. Brush for two minutes twice a day with a fluoride toothpaste and clean in between your teeth with 'inter-dental' brushes or floss. If you are looking for dentists in your area who can offer you high quality white cosmetic crowns with affordable prices, please contact our dental practice in Worthing town center.